In striking the copper anode of the X-Ray tube the majority of electrons experience nothing spectacular; they undergo sequential glancing collisions with particles of matter, lose their energy a little at a time and merely increase the average kinetic energy of the particles in the target which in turn gets hot. The minority of electrons will undergo a variety of glancing collisions of varying severity; the electrons are decelerated imparting some of their energy to the target particle and some in the form of electromagnetic radiation equivalent in energy to the energy loss experienced at each collision. Since these collisions usually occurs at a slight depth within the target the longer, less energetic, wavelength are absorbed within the target material. Where V is the tube selected voltage. 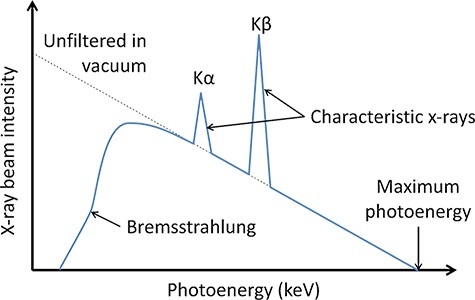 X-rays are produced through two processes: bremsstrahlung and characteristic emission. In the x-ray tube, electrons are accelerated by an electron gun across a potential difference of 20 or 30 KV. These high energy electrons strike the copper anode. Many of the high energy electrons strike electrons from the first two electron shells (historically called the K and L shells) of the copper anode. The removal of these electrons leaves holes which are quickly filled by electrons from higher energy levels. 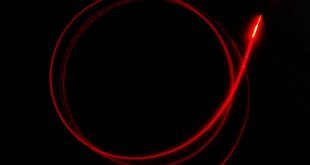 When an electron transfers from a higher to a lower energy state, a photon is emitted. The most common transition is from the second to first energy level, which is known as the Kα transition. In copper, the Kα transition has an energy of 8.04 KeV. We have already seen the Bragg diffraction technique in the Post Bragg Diffraction , exploiting this procedure it is possible to examine the whole x-ray spectrum, in order to evaluate the minimum wavelength (maximum energy) and demonstrate that it is related only to the voltage applied to the tube regardless of the anode material. It is also possible to study the “characteristic” line spectrum superimposed upon the white spectrum and verify that these lines are related to the elemental composition of the anode and not to the voltage applied. Knowing the lattice parameter d and the angle θ it is possible calculate the radiation wavelength λ. With our diffractometer we measure diffraction reflections from a LiF single crystal, as depicted in the image below. The spectrum is a representation of the emission spectrum of the x-ray tube. However the intensities are not preserved because they depend on the scattering efficiency of the LiF crystal lattice. Anyway we can infer the main features of the spectrum. There is a “white” spectrum with a minimum wavelength (this is shown mainly in the second chart) which corresponds to the voltage applied to the tube. The higher the voltage the lower the wavelength. There are two evident peaks which correspond to the Kβ and Kα emission from the copper in the anode. Changing the voltage, from 20 KV to 30 KV, the position of the peaks (i.e. the energy or wavelength radiation) does not change. Increasing the voltage you obtain an increase of the intensity of the peak. Knowing the voltage applied to the x-ray tube we can check the Planck law on the electromagnetic quanta. The energy acquired by an electron accelerated with a V voltage is E = Ve , where e = 1.6×10-19 coulomb, while ν = c/λ where c is the light speed c = 3×108 m/s , from the Planck law we know that E = h ν , thus if we know the frequency (wavelength) of the radiation correspondent to a certain voltage (energy) we can check the Planck law and calculate the Planck constant. We obtain for the Planck constant values around 7×10-34 Joule x s which is not far from the accepted value of 6.62×10-34 Joule x s .